This well be a serious blog this morning. My head is still reeling, my heart can’t decide to sing or scream. I am crying. Last night 120 people gather at The Gallivant in Camber Sands, East Sussex for a dinner dance with raffle and auction all in aid of Teenage Cancer Trust. If you read some of my other blogs you will know that 9 years ago our daughter Ally died of liver cancer aged 15 1/2. Teenage Cancer Trust was her chosen charity because she hated all the wards she went into -either surrounded by babies or the elderly dying. TCT builds and runs wards that are specifically aimed for teenagers and their needs -Please follow the link below to see more. What a night! We were in the company of a great bunch of folks, some of whom had come hundreds of miles for the evening! Quite a few of them were involved in the fruit importing business, as is the fantastic guy who organised and indeed paid for the evening. Michael and his partner Pascale have been absolute stars, only needing our help in gathering auction and raffle prizes. They have been involved in TCT for quite some time, but I only met them last year when Louise Scott came to Rye as the South Eastern Fund Raising Rep and set up our Rye Area Fund Raising Group. Last night was such a success because of their hard work and fantastic friends. We started the evening with an open bar to get us in the mood, and then a three course meal…as you can imagine the noise level was fun with 120 folks enjoying themselves!! On each table was the raffle ticket box and we all ‘bought’ half a playing card, with the other half going into the draw. I was very grateful to Richard for coming home early and supporting me… Also it was a good chance to catch up as well as me the great people on our table. The couple to my right had come from North Essex, and the couple to Hubby’s left had come form North London. Tales of children, grandchildren, and our work were swapped, amid wine and great food. Then came the auction… The girls on the committee had our clip boards and forms and acted as spotters for the very animated Auctioneer. As you can imagine there was fierce bidding for things like two Rolling Stone tickets, a day at Ascot, Cheltenham Ladies Day, Wimbledon Centre Court tickets and many other wonderful things… Michael was brilliant at getting the bidding going, and going upwards, and upwards, and much rivalry amongst friends led to great final figures for eg David Beckham signed shirt! You can imagine! Exhausted, we gathered in the payment forms and gave them to Louise to count whilst the raffle was drawn. Nicola and I went out to the bar(!) to help folks chose their prizes and take their names so we can thank them later. I put in a Valentine’s weekend in my cottage, and it went to a lovely young lady, Sarah, who I will make sure has a magnificent Welcome Basket! Then the dancing began! Needless to say it was mainly the ladies dancing watched but their other halves… Quite a few calories were used up on that floor dancing to the great live band! Hubby and I watched for the sidelines basking in the fun and happiness. I started to shake, Hubby grabbed my hand, and the tears came…they are coming now as I type this too. The loud cheer that was raised still didn’t show how I felt. Such generosity, such kindness. This is the biggest amount raised in one event in the South East .. So far! Louise Scott and I just hugged, and as my tears started again Richard and I agreed it was time to leave before I started howling! Hubby was finding it hard to stay in control too. So, as I slowly backed out of the carpark and headed home I silently hugged our Ally, wishing, oh wishing so hard she was there to celebrate with us! When we got home we told Son the amount and he was blown away. We all sat down, the boys with a brandy, and just thought our thoughts. Son said he was glad he hadn’t gone as he would have had to get drunk to cope… It is easy to forget all he has lost and must still feel! As I sit here at my kitchen table, looking out on a damp garden, I pray that those wonderful people never have to use the facilities they have helped build. I thank them with all my heart! They have raised a 5th of a new unit in one night!!! Please forgive any spellings etc in this blog, and lack of pictures. I am publishing it now as I want to share the fab news with you now… I will add pictures etc later, but for now…. May you never have to use a Teenage Cancer Trust Unit; may all your endeavours be as successful as last night. for the Auctioneer, who was fantastic. Woohoo! Weigh in day today and I’ve now lost 23.5lbs. 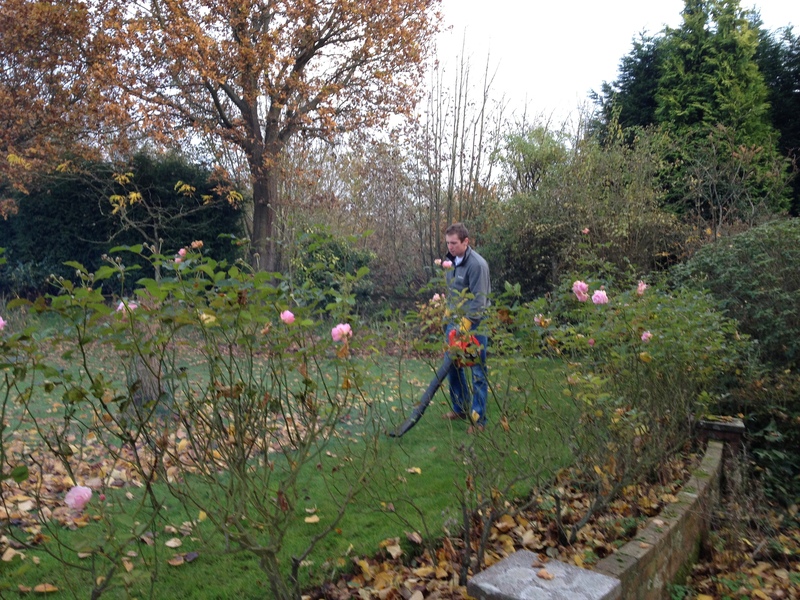 I have had a wonderful afternoon in the garden with Son…Leaf Herding. This is the art of moving ‘leaves’, the foliage of ‘trees’ if you will, from the place which they have fallen upon, in this instance my ‘lawn’, to a ‘pile’ somewhere where they can rot down and be used as ‘compost’. Are you with me so far? Why are you going red? This is serious stuff! Here you can see some of our fallen leaves waiting patiently for our attention. 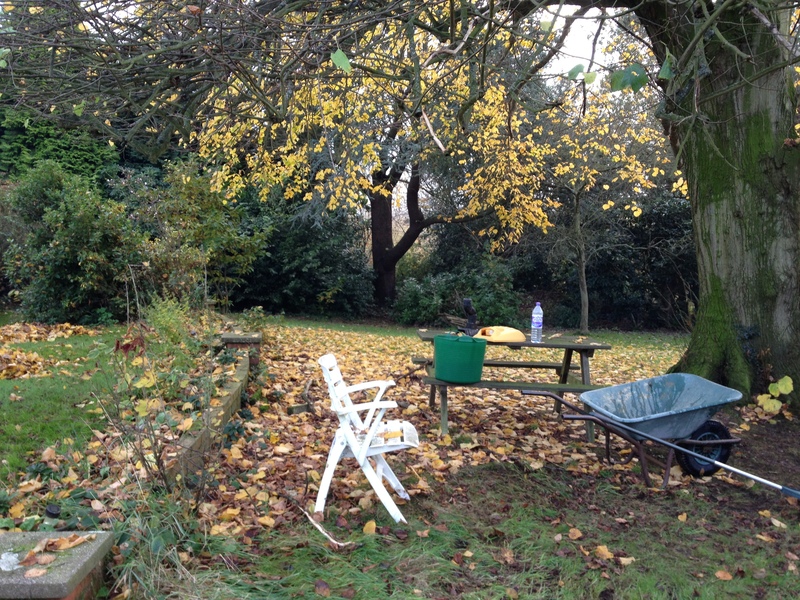 Kindly note the bottle of water, and the yellow mound on the table which are the plastic “hands” we use to transfer the ‘leaves’ from the ground into the preferred mode of transport – the ‘Wheelbarrow’ as seen above. All of our operatives are fully trained in the use of all implements. 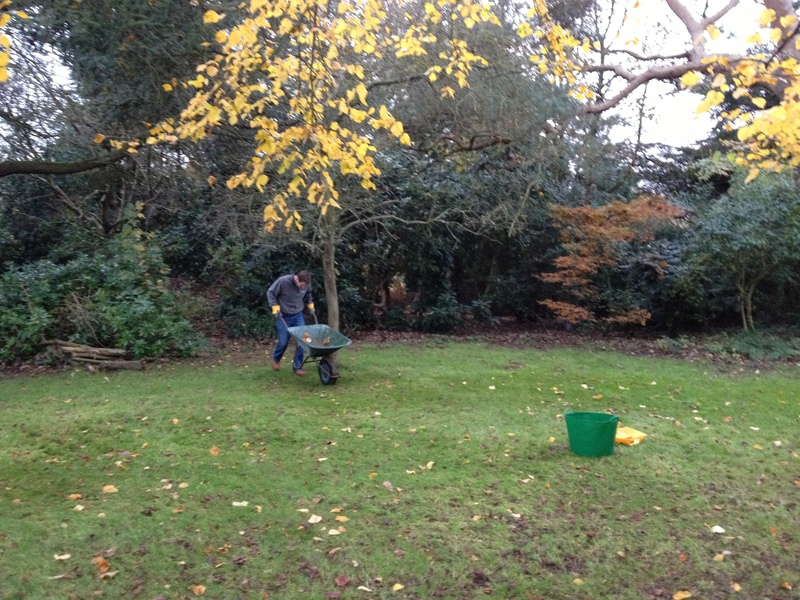 Today we decided to use two methods…the traditional one using the ‘Rake’ and the modern one of the ‘Leaf Blower’. 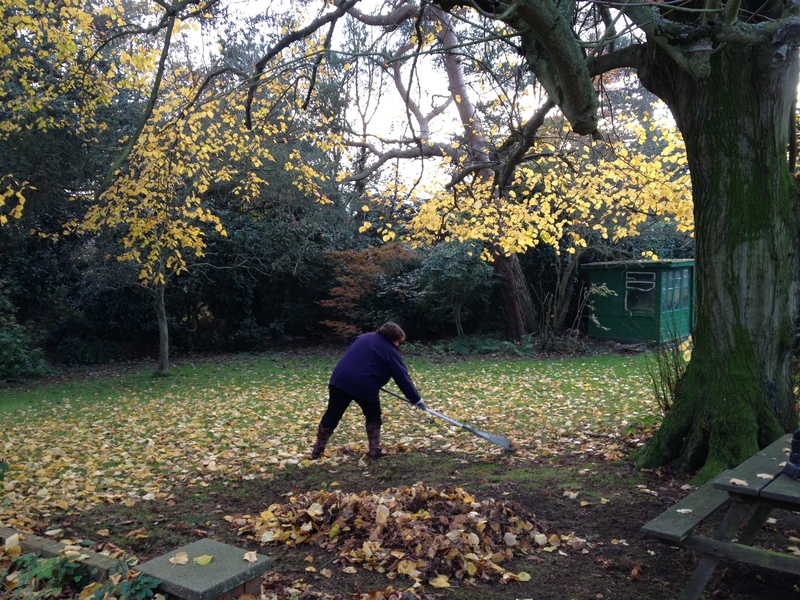 And here I am demonstrating the Old Fashioned method, using what we call a ‘Rake’, and ‘physical exertion’. This is my preferred method as to my mind it collects more ‘leaves’ and uses more ‘energy’, thus saving on heating bills in the home! 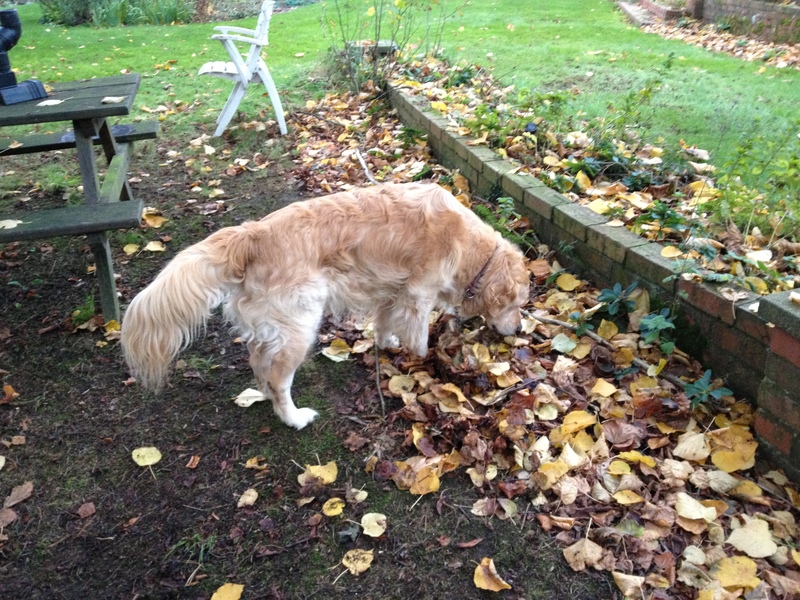 Even our dog Buddy wanted to demonstrate his own method, but picking up one or two leaves at a time and them running around with them doesn’t really help! And so, after one and a half hours of ‘blowing’, ‘raking’, ‘lifting’, ‘filling’, ‘wheeling’,’emptying’ and generally working out, Son is able to to put down his ‘barrow’ by the garden ‘shed’, put away the ‘Blower’, the ‘Rake’, his ‘gloves’, my ‘gloves’, and wearily walk into the house to collapse in a nice hot ‘bath’ with a cup of ‘tea’. So, in conclusion… each to his own method. I am bouncing with joy! Well, I would be if my body wasn’t so tired after my workout yesterday!! I have now lost 16lbs!!! So my first goal of a stone has been reached! Huzzah! Throw hats in the air, all cheer, hugs all round, and general scenes of merriment. Ok, so it has taken me 7 weeks, but I feel so much better, and it is not as if I am actually on a diet! Even Adam, the Personal Trainer, was happy!!! After all the joy of telling Adam my weight came the workout…oh boy! He upped the weight on the kettle-bell for the squat and made me swing it up above my head in a controlled way (ha! ); and the sit-ups, or crunches!!!! OMG doesn’t even cover it! My stomach feels them today! Adam says he wants me to do perfect sit ups on my own ( he wasn’t helping before!!) by the end of 2 weeks from today!I can hear you lot saying ” no problem.I can do them now” No-one likes a boaster, ok?! Lets just see how these much under-used tummy muscles can do, shall we? So, how will I be celebrating? OOO, I am going to be daring and have a Low Fat Hot chocolate, cos its flipping cold here! I know, stop the excitement! Well, dear readers, that’s all that I can cope with for the mo… am off to put the kettle on!